The toggle field allows the user to enable or disable the field by switching between two states, like on and off. 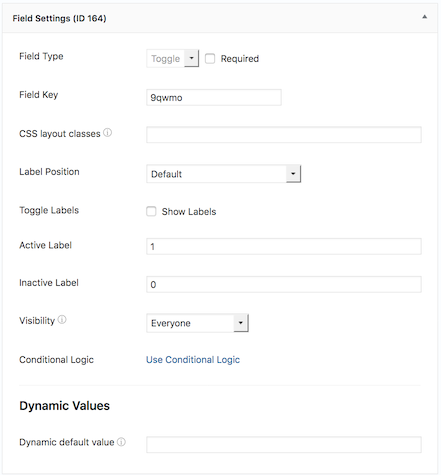 In addition to the standard field options, a Toggle field has a few field specific options. Select 'Show Labels' if you would like the 'Active' and 'Inactive' labels shown with your toggle button. Set the 'Active' and 'Inactive' labels for your toggle field when the labels are shown on the page. Please note that if you leave the default labels, they will not be shown when 'Show Labels' is selected. The Toggle field is treated as "blank" if the field is inactive. If the field is active, the toggle field stores a value of 1 by default. The Toggle Labels are not stored in the entries for this field, so take that into account when using a Toggle field, or using conditional logic based off of a Toggle field. Some toggle field styling is available in Formidable → Styles → Edit Styles → Toggle Fields.